The twin city’s 100 keenest home bakers will soon get the chance to meet the country’s top Cake Masters, Masterchef finalists, baking brands, fellow bakers & enter a Telangana theme cake competition. 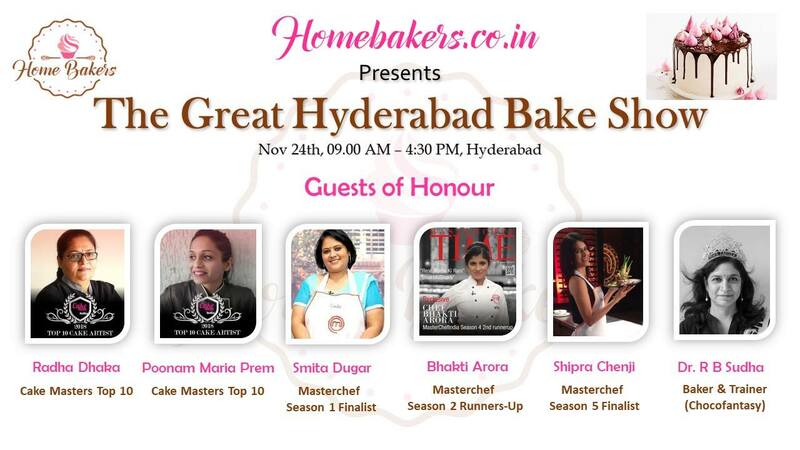 HomeBakers.co.in, is holding its first ‘The Great Hyderabad Bake Show’ on November 24, 2018 at Hotel Trishul Grand, Madhapur for bakers and baking suppliers in Hyderabad city who are crazily obsessed with baking. Anuradha Kambi, another co-founder of HomeBakers.co.in added, “It’ll be a great day out for the city’s bakers. The day has four key parts – Telangana theme cake competition, 6 bakers-led masterclasses, 4 baking brands-led demonstrations and a panel discussion on the path to become a successful home baker and the future of home baking industry. The esteemed panel includes country’s top Cake Masters like Mrs. Radha Dhaka, Mrs. Poonam Maria Prem and city’s top cake trainer Dr. RB Sudha who is also crowned as Mrs India Andhra Pradesh 2018”. All registered bakers will set up their homemade cake along with the recipe before 10 am on the day. Country’s 2 top Cake Masters (Mrs. Radha Dhaka, Mrs. Poonam Maria Prem), 3 Masterchef finalists (Ms. Smita Dugar from season 1, Ms. Bhakti Arora from season 4 and Ms. Shipra Chenji from season 5) and Dr. RB Sudha, city’s cake trainer will be judging the cake competition on the day. Winners will get a gift hamper and vouchers worth Rs. 5,000 plus a gift hamper and a runner’s up worth Rs. 2,500 plus a gift hamper. Even participants will have a takeaway goody bag full of ingredients from top brands. On that note, Homebakers.co.in cordially invites you to the the Great Hyderabad Bake Show on November 24th, 2018 at the Hotel Trishul Grand, Madhapur between 10 AM and 4.30 PM. Your kind participation will help us build and grow Hyderabad’s home bakers community. Looking forward to welcoming you.